That’s when some unidentified person muttered “f—— a——” — presumably directed at Skolnick. 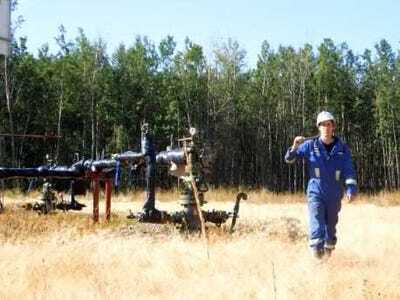 Encana is seen by some as a mismanaged company — it’s long been the subject of criticism from investors, and the US Department of Justice has investigated to it in relation to illegal actions involving Chesapeake. Skolnick, who has long been cool on the company, was asking specifically if Canada’s new investment rules would prohibit Encana’s takeover by foreign state-owned entities, Reuters reports. His question was timely — Canadian energy companies have recently seen a number of takeovers by foreign companies keen to get in on the oil sands business. Encana has apologized for the outburst, but the evidence isn’t going away. Encana contacted the owner of Chirbit on Thursday, claiming that the company owns the copyright of the recording and thus it should be taken down. Chirbit has, so far, refused to take the recording down. While Encana may have the legal high ground here, the reality is that once something is on the internet, it’s there to stay. For example, here is a Soundcloud recording of the call. You can bet if the Chirbit file is taken down, the clip will reappear somewhere else.